A 53-year-old female reported with burning sensation in lower right posterior region of oral cavity since 2 years. Her mandibular molars from right side were extracted due to mobility, resulting from generalized chronic periodontitis, before 3 years. She had been given a removable partial denture to replace the missing teeth. However, she was unable to wear it due to burning sensation. Intraoral examination revealed a diffuse erythematous lesion involving the mucosa of lower posterior edentulous alveolus on right side.Patient was a known case of type II diabetes mellitus and was under medications for the same.With provisional diagnosis of erythematous candidiasis, the surface material was collected by rubbing sterile swab on the lesion. 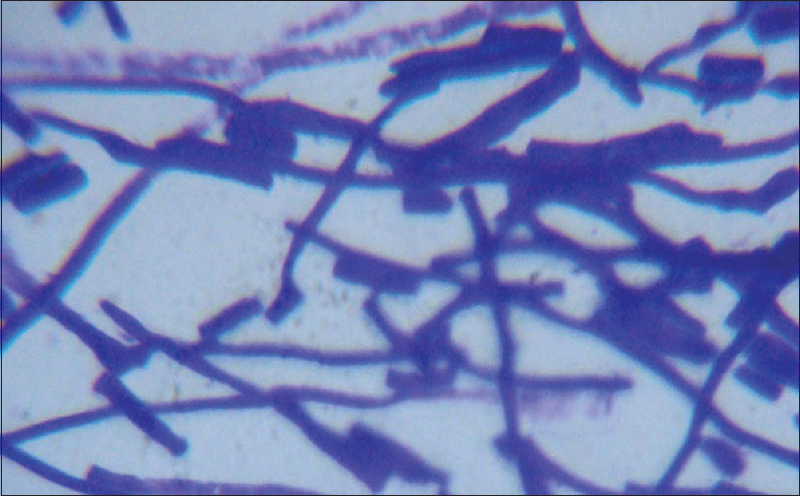 A microbial smear was prepared of the collected material and stained with Gram stain for microscopic examination. On microscopic examination, numerous Gram positive nonbranching septate hyphae, few epithelial cells and debris were observed [Figure 1]. Suspension of the collected material was prepared by agitating the swab in few drops of saline. This suspension was inoculated on the culture medium, "Sabouraud's dextrose agar with chloramphenicol", for confirmation. Inoculation of the specimen was done in laminar hood to avoid the environmental contamination. After incubation at room temperature for 24 h, microscopic examination of the colonies revealed numerous entangled hyphae and immature contiguous spores [Figure 2]. At the end of 48 h, white circular colonies with fine granular or powder-like surface were observed [Figure 3]. 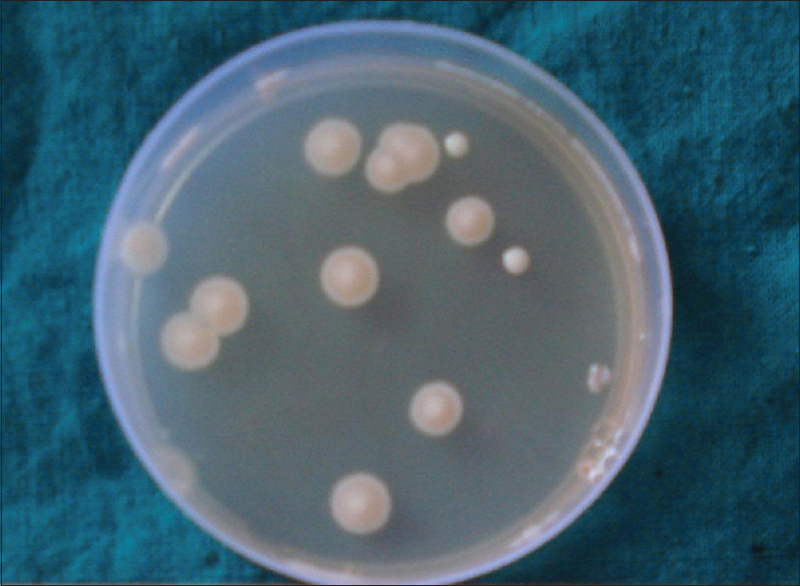 The colonies were emulsified when touched with sterile microbiological loop. 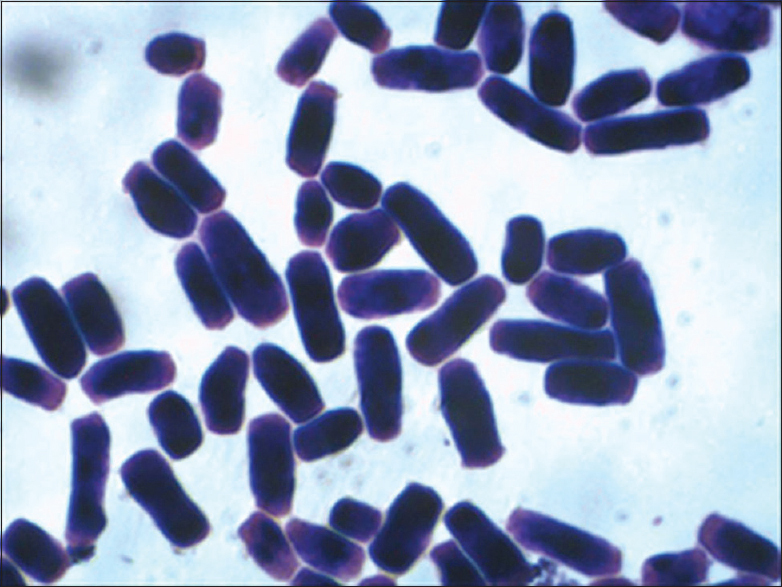 Gram stained smear of the material obtained from colonies showed numerous cylindrical or barrel-shaped arthrospores [Figure 4]. 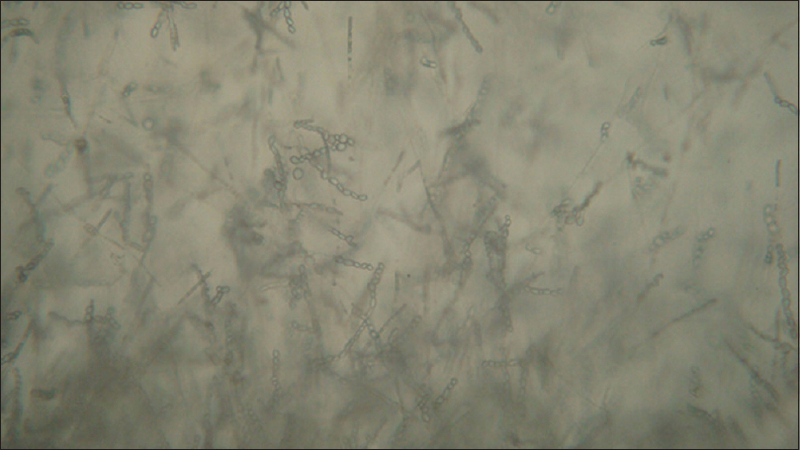 A wet unstained smear was prepared and examined under microscope, which also showed rectangular arthroconidia [Figure 5]. Clinical features, morphological examination and cultural characteristics in present case suggested the possibility of Geotrichum or Trichosporon species. To differentiate these two, urease test was carried out, which was negative [Figure 6]. Based on microscopic, cultural characteristics and biochemical reaction the fungus was identified to be from Geotrichum species. Fungal genomic DNA was isolated from the culture. Using consensus primers 18s ribosomal ribonucleic acid (rRNA), 5.8 rRNA, 28s rRNA and ITS 1 and ITS 2 gene fragment was amplified using high-fidelity polymerase chain reaction (PCR) polymerase. The PCR product was cloned and sequenced using the forward, reversed and internal primers. 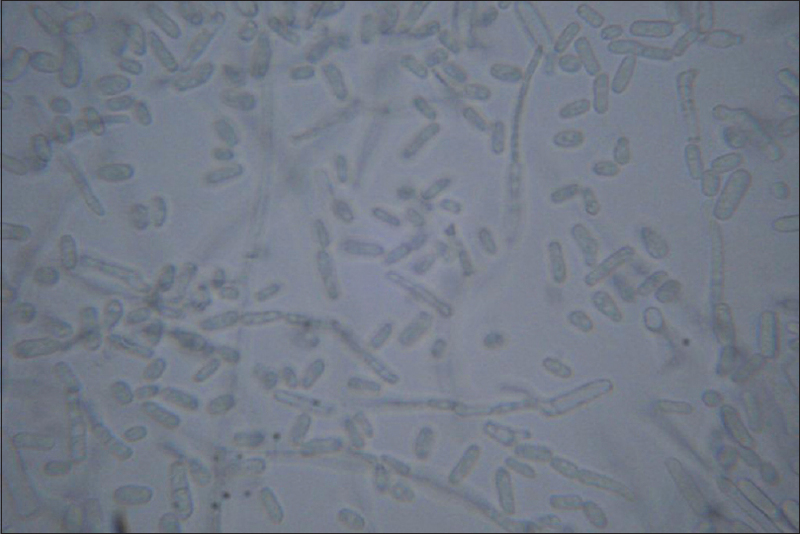 Based on nucleotide homology and phylogenetic analysis, the microbe was detected to be Geotrichum candidum. The organism was found to be sensitive to clotrimazole amphotericin-B and nystatin. The infection was resolved after topical clotrimazole treatment for 7 days. The fungus usually produces creamy white, smooth, shiny and convex colonies similar to candida. Some isolates produce colonies similar to molds with fine granular or powdery surface. These dry appearing colonies emulsify when touched with microbiological loop, which is a clue to identification of this fungal species. Geotrichosis may be more common than generally assumed. It may be frequently misdiagnosed as candidiasis due to similarities of clinical features and response towards anticandidal treatment. However, it should be considered in the differential diagnosis of oral mucosal infections in immunocompromised patients. Careful microscopic examination and thorough evaluation of cultural characteristics are sufficient to identify Geotrichum species and to differentiate from other fungal species. Antifungal susceptibility testing may become necessary for appropriate treatment of such lesions. Forbes BA, Sahm DF, Weissfeld AS. Laboratory methods in basic mycology. In: Forbes BA, Sahm DF, Weissfeld AS, editors. Bailey and Scott's Diagnostic Microbiology. 12 th ed. St. Louis: Elsevier; 2007. p. 629-716. Rajendran R, Sivapathasundharam B. Shafer's text book of Oral Pathology. 7 th ed. New Delhi: Elsevier; 2012.p. 369-70. Neville BW, Damm DD, Allen CM, Bouquot JE. Oral and Maxillofacial pathology. 2 nd ed: Philadelphia: Elsevier; 2002. p. 204-5. Bonifaz A, Vázquez-González D, Macías B, Paredes-Farrera F, Hernández MA, Araiza J, et al. Oral geotrichosis: Report of 12 cases. J Oral Sci 2010;52:477-83. Heinic GS, Greenspan D, MacPhail LA, Greenspan JS. Oral Geotrichum candidum infection associated with HIV infection. A case report. Oral Surg Oral Med Oral Pathol 1992;73:726-8. Hattori H, Inouve C, Tomita Y, Kanbe T. A case of oral geotrichosis caused by Geotrichum capitatum in an old patient. Jpn J Infect Dis 2007;60:300-1. VergheseS, Ravichandran, Geotrichum candidum infection in a renal transplant recipient. Indian J Nephrol 2003:13:72-4. Amft N, Miadonna A, Viviani MA, Tedeschi A. Disseminated Geotrichum capitatum infection with predominant liver involvement in a patient with non-Hodgkin's lymphoma. Haematologica 1996;81:352-5.